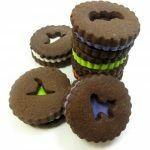 To make these delicious, colorful chocolate sandwich cookies, I used the chocolate cut-out sugar cookie recipe and the sugar cookie icing recipe from my book, which also worked really well. 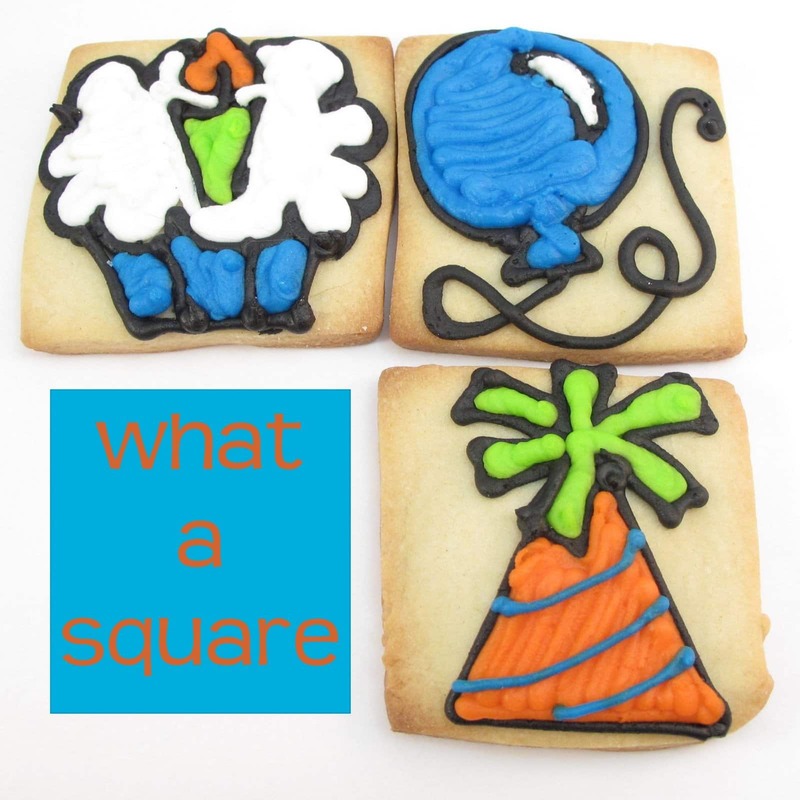 I made these chocolate sandwich cookies for my Dad’s birthday, and he also got these square treats. Roll out chilled chocolate cookie dough and cut out 1 1/2 inch circles. Bake on a parchment paper-lined baking tray according to recipe and let cool completely. TIP: Each time I had to roll out some dough, I cut out an even number of circles. That way, I could just pair up top and bottoms that were exactly the same thickness. When making frosting, make sure the consistency isn’t so thick you can’t work with it, but it should be stiff enough to keep its shape. Tint about 1/2 to 3/4 cup of frosting with each color you’d like (yes, I did actually tint the white, too). Prepare a frosting bag with size “12” tip, fill with frosting and tie closed tightly with a rubber band. Pair up all of your cookies on the tray so each pair is of similar thickness and diameter (in case of any oven spreading). Turn one cookie from each pair over and pipe frosting to cover the entire backside of the cookie. I started with piping a circle around the outer edge and continued to pipe in a spiral to the center. Top with the other cookie, making sure the back of the cookie sits on the frosting. Hence, the bottoms of the cookies are on the inside. Let dry overnight if packaging. Cream butter and sugar. Add the egg and vanilla and blend. Mix together the dry ingredients and gradually add to the wet. Cover and refrigerate 1 to 2 hours. When chilled, roll out on a floured surface, cut out shapes, and bake on a parchment paper-lined baking tray in a preheated 375 degree oven. Bake 8 to 10 minutes for small cookies, 10 to 12 minutes for larger cookies, or until edges are crisp. TIP: In lieu of flour, which may show up on the surface, you can roll cookies between two pieces of wax paper. I love the boldness of the colors! So cute, I love the bright colors! The colours in those cookies are gorgeous! I love the cookies! Such wonderful colors! LOVE this idea!!!! They are sooo cute! So cute! The colors are great! 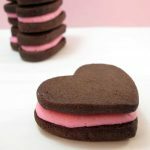 I love making homemade oreos! 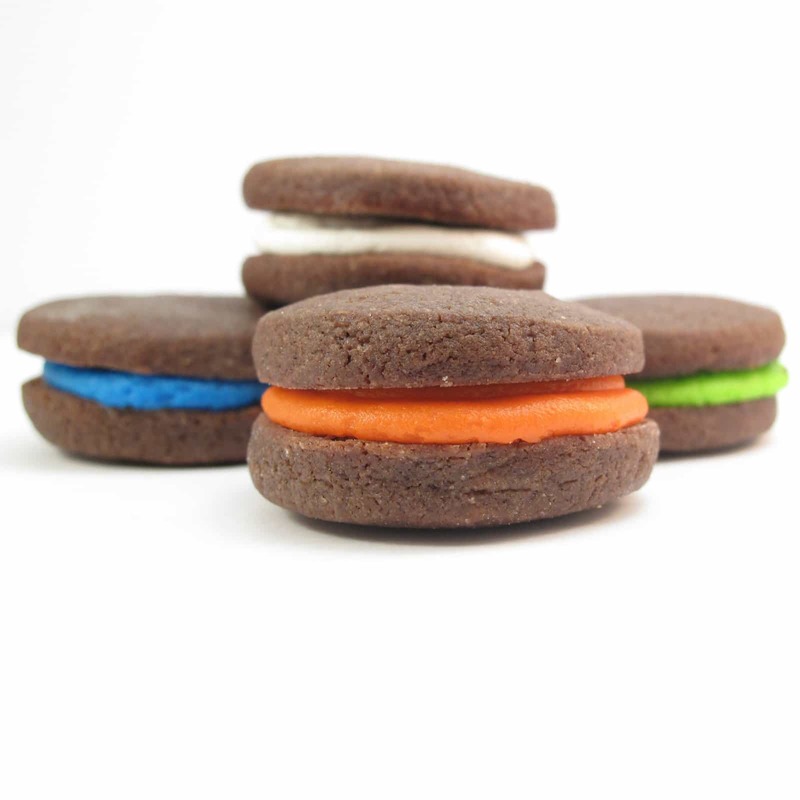 I love the colourful frostings in the sandwich cookies! what fun! wow! love the colors! bright and festive. omgoodness! that is YOUR book. i bought it over christmas time so i could make sugar cookies for the fam. you're famous in my house! thank you all! yes, b is for brown, c'est moi! so glad to have found fame! and glad you enjoy the book! My brother ( in Atlanta) sent me( Singapore) some lovely cookie cutters, I just cant wait to get started. Here in Singapore is very hot and humid. 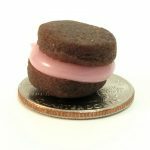 Will these cookies need to be stored airtight? for how long? How long do your frosting take to dry up before storage. Thank you for your expert advise. Super cute blog, Roberta! Thanks for commenting! Thank you Jacqui! Usually you can store cookies at room temperature (air tight not necessary) up to one week, and I let them dry overnight. But with the humidity, I would let them dry two days. Try and keep them in a cool spot, if you can. 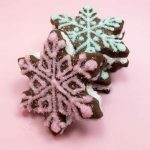 Humidity can make the icing soft! Good luck! 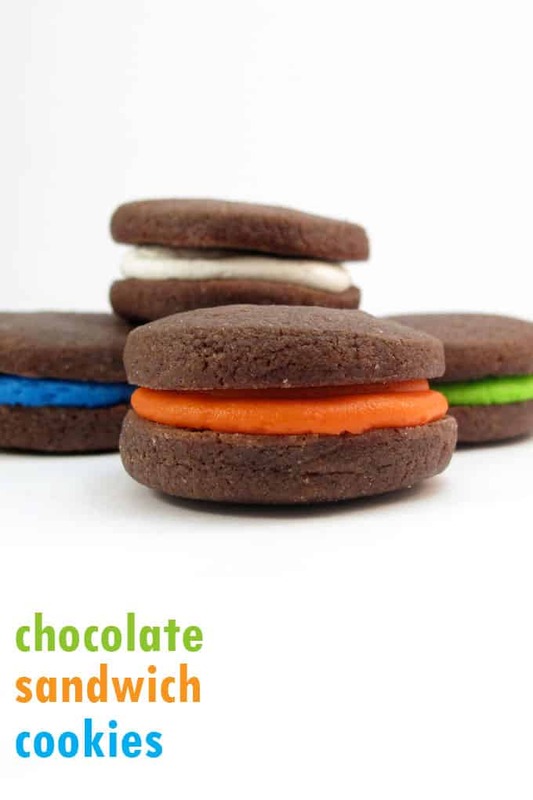 I was going to try to make homemade oreos for my kiddos (the little guy who is 2 LOVES and lives for his oreos), but I think I will give these a try! So much more exciting and colorful than a boring old oreo! I love the idea of using the different colors for the icing. So bright and cheerful! So tasty! 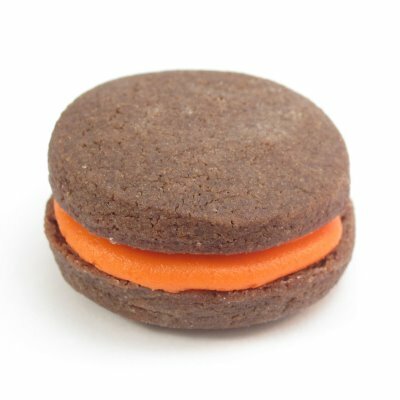 I took a cookie decorating class last week and learned that there is a kind of cocoa called black cocoa available for homemade oreos. I used it in these cookies and they look and taste like oreos, only better. I found that the dough spread a little more with this cocoa. Not sure if it is the cocoa or just that I let my butter get too soft or didn't chill my dough well enough. I'm still learning. Have you ever used black cocoa? What were your results? I've never even heard of black cocoa, but makes sense for Oreos… will have to check that out! thanks! I definitely want to hang onto this idea for Halloween cookies with the orange frosting in the center. Awesome idea, youre amazing!